The Germans were certainly big fans of halftracked vehicles for increased mobility. They had unarmored vehicles in the 1, 3, 5, 8, 12 and 18 metric ton classes, armored personnel carriers in the 1 and 3 ton classes, and many more derivative vehicles and conversions. Among modelers they have always been popular, and of the six major classes probably the most popular is the Sd.Kfz. 7 8 ton halftrack. With more than 3,200 built, it was used as the prime mover for the 8.8 cm antiaircraft guns and 10.5 and 15 cm howitzers. 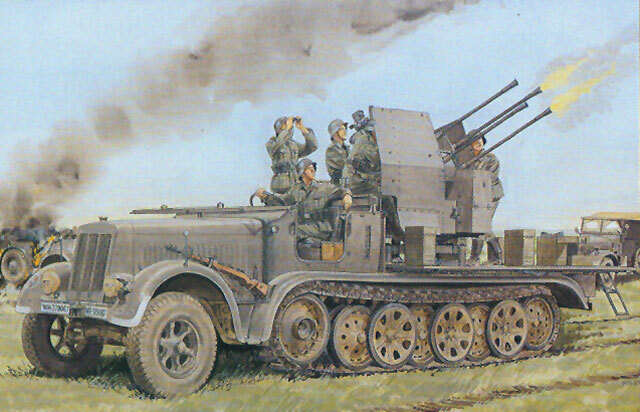 Later two variants were created by modifying the 8 ton to a flatbed and adding either four 2 cm guns (Sd.Kfz. 7/1 - 319 converted) or a single 3.7 cm gun (Sd.Kfz. 7/2 - 123 converted) for self-propelled air defense. This vehicle has been popular in just about every scale used by modelers so far except the giant scales (e.g. 1/25 and 1/16) and 1/35 is no exception. When Tamiya released their then world class leader 8.8 cm Flak 36 kit back in 1973, modelers could not wait until they released the 8 ton to pull it. Later they did release both an Sd.Kfz. 7/1 and much later an Sd.Kfz. 7/2. But in the meantime tastes change, and since the original kit was motorized it suffered from a lot of compromises which hurt its accuracy. Many aftermarket kits were released to upgrade or correct it, but it still left much to be desired. In 2007 both DML and Trumpeter announced new 8 ton kits. Trumpeter was the first to get theirs to market with an eager public awaiting the kit, but unfortunately it appeared to be rushed and suffered a number of errors. DML apparently shelved theirs for the moment when the other kit was released. In late 2008 Trumpeter announced a kit of the Sd.Kfz. 7/1 with the 2 cm Flakviering, but this time DML has released theirs first and beaten them to the punch. From the breakdown of molds this kit shows that we probably can expect a separate 2 cm Flakvierling 38 kit (or more likely Wirbelwind and Moebelwagen kits on their Pzkw. IV chassis) as well as the long awaited Sd.Kfz. 7 to tow their 10 cm and 15 cm artillery pieces and 8.8 cm AA guns. DML has provided a very thorough kit with a complete engine and undercarriage to include the winch and all associated parts, as well as the flatbed body with etched brass mesh panels for the fold-out sides. Some things remain the same – for example, the two-piece “Magic Track” halftrack tracks are included, but as often noted are very small and DML could have made many modelers happy by molding them as one-piece runs in DS plastic. Also, as the kits are “Smart Kits” they make use of slide molding and other tricks to avoid needless small parts assemblies and minimize the use of brass. The bed is nicely done and the rear fold-down panel (note these are either/or and not operating parts) has twin folding steps with two different sets offered (folded or extended). The crew seat may be shown either folded up or down as well. A rack is provided on the front left fender for two Kar 98K rifles as well. The 2 cm Flakvierling 38 is all new as well and has new guns with slide molded barrels and flash hiders. As with previous DML antiaircraft gun offerings, there are different sight articulation bars provided for setting the guns at either 0 or 60 degrees elevation, but the guns will not move if the bars are used. Two different types of gun shields are provided, as are a number of magazines and ammo racks for the installation. This is the first DML kit which also provides masks for the windshield sections so that the model may assembled and then painted, and which is a nice touch. Four different finishing options are offered with a small sheet of Cartograf decals, but it also provides a license plate “number jungle”. The variants which can be modeled are: 24th Panzer Division, Stalingrad 1942 (grew with unit markings in white); Unidentified unit, Eastern Front 1942 (grey with whitewash spots); Unidentified Luftwaffe Flak Abt. Russia 1943 (grey with whitewash stripes); Unidentified Luftwaffe Flak Abt. Russia 1942 (grey with whitewash stripes and small markings on cab panels). Overall this looks to be another winner, and hopefully DML releases the “straight” 8 ton faster than it did with the M2 and M3 US halftracks.